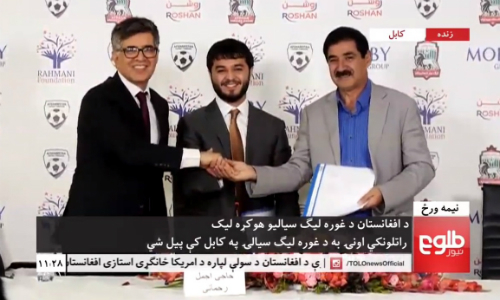 Haji Ajmal Rahmani, the head of the Rahmani Foundation, said at a press conference in Kabul on Thursday that his foundation had stepped in as a key sponsor for this year’s Afghan Premier Football League (APL). Rahmani said that after previous sponsors pulled out, he stepped in and together the football federation and his foundation had reached an agreement to fund the tournament. This year’s APL will kick off on Sunday and is the 7th annual such event. This last minute sponsorship comes after the 2018 season was initially postponed due to the lack of funding. Until now the league has been sponsored by the private sector and supported by the international community. It not only provides entertainment for millions of Afghans worldwide, but promotes national unity, combats radicalism, and works to eradicate drug usage. Eight zones will still be represented but instead of holding the tournament over three months, it will not run for just a month. According to APL Commissioner Shafic Gawhari, this time frame has had to be reduced due to the change in weather and the possibility of an early onset of winter. Gawhari also said he is confident that this year's tournament will be as successful as the past 6 tournaments. Over the past six years, the annual tournament has grown tremendously in popularity and draws thousands of spectators and millions of TV viewers each year. The league matches are held at Kabul Stadium each year. A draw for the football teams was held on Monday in which eight squads were divided into two groups. Based on the draw result, Shaheen Asmayee from Kabul, which was the champion in the sixth APL tournament, has been placed in the first group with De Spinghar Bazan, Da Abasin Sapi and Mawjhai Amu. Meanwhile, Oqaban Hindukush, De Maiwand Atalan, Toofan Harirod and Simorgh Alborz will play in the second group. Shaheen Asmayee will play Mawjhai Amu in the opening match next week on Sunday. This year, all matches will be held at night. This year’s APL is back on track after a local businessman stepped in to rescue the much-loved annual tournament.